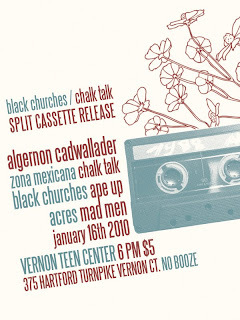 Algernon Cadwallader, Chalk Talk, Ape Up!, Zona Mexicana, Acres, Mad Men and Black Churches will all be at the Vernon Teen Center on Jan 16th. Chalk Talk/Black Churches are dropping a new split and this will be the show to scoop one up at. Hit it up but don't bring booze, it's a teen center for goodness sakes.